As I sit to write this post, I am noticing something about myself. I am tense. Wound up. My mind is racing and I can’t seem to settle my thoughts. The relationships in my life are strained. Because of my desire to please folks and say “yes”, I am having to say “no” to many things much more important. This busy season of life has reduced me just “being busy”. You see, I am a guy who is struggling to establish boundaries. I have no real frame of reference for doing so. My assumption is to remain successful in life, you say “yes”. It is really foggy today as I write. In Texas, the fog isn’t a normal occurrence so on days like this, you take notice. As the fog settles in, you can’t see more than fifty feet in any direction. Really, it is unsettling. Dense fog shrouds what is familiar. When you can’t see what is usually visible, it is easy to get turned around and lost. There is no point of reference. After you are in it a while, everything starts looking the same. Which brings me back to the tension in my body. No massage or good nights sleep will cure this. What I need is something to center me. To bring me back to what is important-to what is true and meaningful about life. I don’t know about you, but community tends to be the gush of dry wind that clears the fog from the landscape of my life. Like so many, I need people who will willingly pour meaningful things into my life. As time goes on, I realize that folks like this are hard to find. As the fog starts to lift outside, I am thankful for those who surround me – pushing the fog away and not letting me be sucked in. At times like this I am thankful for my wife and family, and the two guys I write with on this blog. Beautiful things such as marriage, church, friendships, and works of art are born of some kind of community – nurturing and pushing forward meaningful and life-giving things. And, I am thankful for Allen and Trevor because, like my wife and my savior – they chose me. They pour in instead of take away. While we would all agree that we need people who give instead of take in our lives, when we are honest – they are really hard to find. Community is what this blog is built on. The ideas and foundational material you will see in the coming weeks is based upon years of discussions, late nights, long road trips, and hours on the phone. As the fog settles in, we are pressing forward together to make sense of it all. Join us as we search for what is real. Are you in the fog? How has community given you clarity in the fog of life? For more information on the content and purpose of this blog click here. You three have started off with a real love fest, eh? 🙂 That’s good. For all of the downsides we can point to regarding technology, the fact that y’all have remained so close over the years is a testimony to the value of technology. I look forward to following this project. Thanks for the honest thoughts. I look forward to reading and learning more. 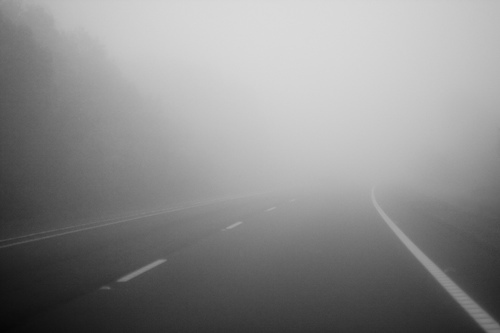 For me, community doesn’t always clear the fog, but clarity comes with knowing that I don’t navigate the fog alone. Ever. Crobey’s wisdom always helps and brings a smile to my face. Thanks Chris from Washington where the literal and spiritual fog as dense way to often.